It’s two years since I was taught to crochet. Not long after my first lesson, I started working on granny squares and granny-square blankets. The first squares I made ended up being donated. The giant granny-square blanket for our couch was started around Easter 2009 and it is about 80% finished and living on our couch. The wool granny-square blanket I started last year is waiting for me to add its border. The baby blanket I started on Valentine’s Day 2010 is about two-thirds done. The top-secret ripple blanket I’m working on is also about two-thirds done and needs to be finished in about four months. 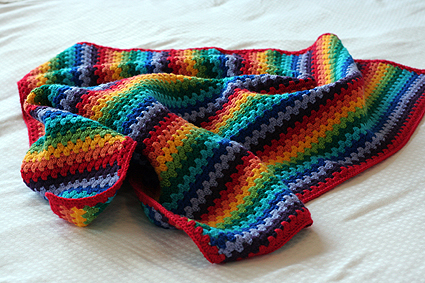 Meanwhile, the rainbow granny-stripe blanket I started in January is now finished – the first blanket I’ve actually completed. As much as I love the making aspect of craft and baking, sometimes the “done” feeling is even better. 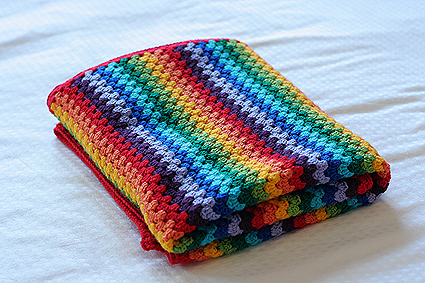 This blanket came from my recent obsession with rainbows. I wanted a (relatively) quick project but was tired of squares. 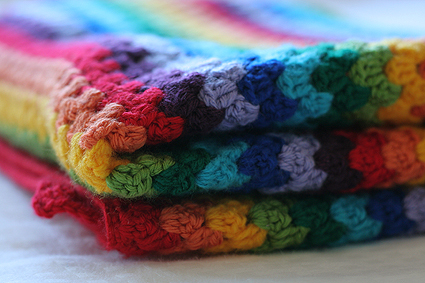 Lucy from Attic 24 has a great explanation of how to make your own granny-stripe blanket. It measures about 90cm x 100cm. It’s yet to find a home but I’m confident I’ll eventually figure out where it belongs. I’m trying hard to get a few projects done before starting any more but, as always, it’s proving difficult not to embark on a new crafty adventure. what type yarn did you sue for granny stripe,cotton?and i love the ripple blanket behind rufus,did you post pattern? I used acrylic – Panda Magnum Soft 8ply and Panda Magnum 8ply. Violet asked a question – Hi! I know this is an old thread but I LOVE this rainbow granny stripe! I was hoping you could tell me how many balls of yarn you used. I’ve never worked with this brand of yarn before and I’d love to make a blanket of the same size with it! Thank you! I just weighed it for you, it’s 750g. Each ball of yarn is 100g so you should be able to make this size with eight balls of yarn. Of course there are nine colours so you should end up with some leftovers. This info is all worked out in retrospect but I hope it helps!